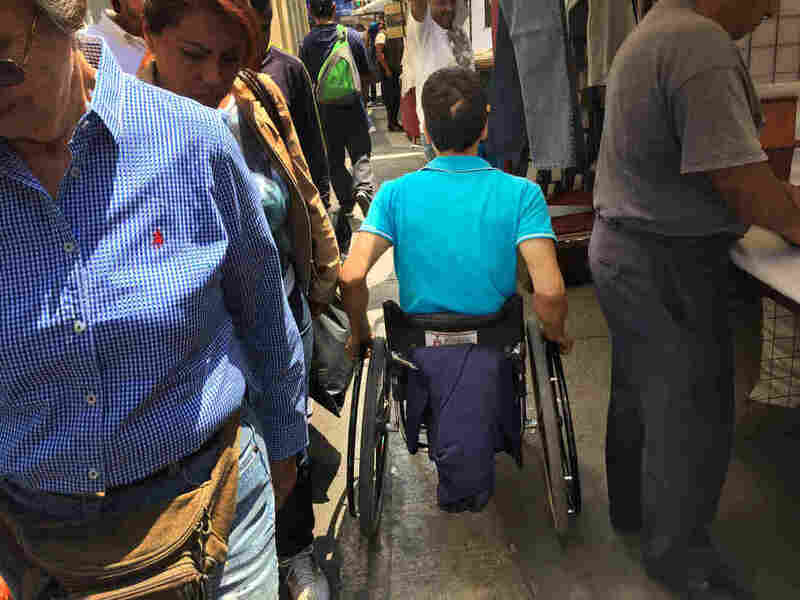 Helping Wheelchair Users Navigate Mexico City's Hectic Streets And Sidewalks : Parallels Mexico City can be unfriendly terrain for those in a wheelchair. But a new program aims to help them better navigate the city's bad traffic, broken pavement and oblivious pedestrians. 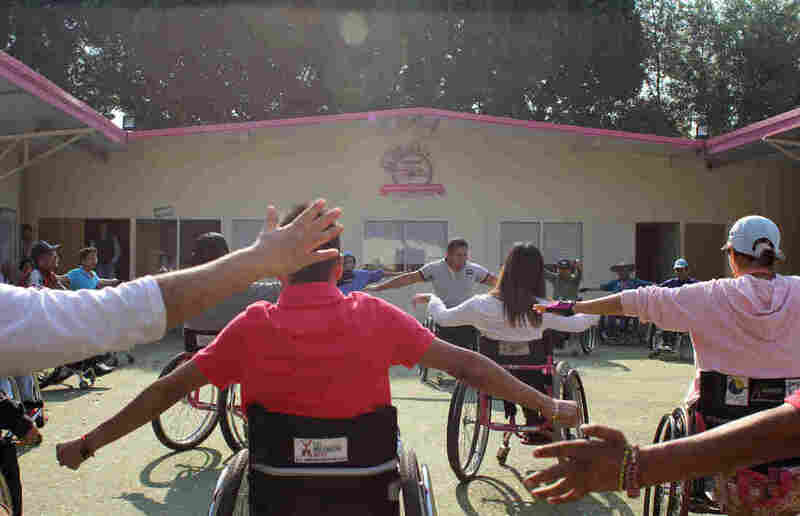 Students at the Vida Independiente wheelchair workshop warm up before class. Jasson Garcia's daily travels look maddening. The sidewalks of Mexico City are broken and cars block pedestrian crossings. In the subway station, there's no elevator, so he has to labor down the stairs. Busy commuters push to get past him. But you don't see this in Jasson's demeanor. The skinny 15-year-old seems totally unfazed. "It just feels normal now," he says. "I can go basically anywhere I want without a problem." Jasson makes his way through the hectic city of 22 million in a wheelchair. He was born with a myelomeningocele, the most serious forms of spina bifida, so he only has very limited use of his legs. "It's frustrating the city isn't accessible," he says, "but whatever. You just have to adapt." Jasson rolls through the crowded streets effortlessly, hopping up curbs and squeezing through tight spaces. His dad, Jonathan, walks by his side but never once reaches out to help. Jasson's wheelchair independence in this city even took him viral. Once a week, on the way to an extracurricular school activity, he had to cross a pedestrian overpass above a highway – 30 steps up, 30 steps down. He insisted on doing it alone and got his dad to film one day last year. They uploaded the video to YouTube and local media went crazy for him. (A more recent video shows Jasson doing the same). But even there, the stereotypes of disabilities lashed back. "People wrote angry messages to my dad, telling him he was horrible for not helping me," Jasson says. "But I wanted to do it on my own." This brash independence didn't come out of nowhere. It took years of training in a wheelchair course with a privately funded organization called Vida Independiente, Spanish for Independent Life. On a hot spring morning, Jasson is one of about 30 people in wheelchairs circled together, warming up, stretching their arms, backs and necks. Most sit in custom-built, lightweight, ergonomic wheelchairs donated by Vida Independiente. Jasson Garcia squeezes between pedestrians and street stalls in downtown Mexico City. One student is just seven years old. Another is in his 60s. Some are built like quad rugby players. Others have cerebral palsy. But the goal is the same. "We want people to demand their rights, but we also want them to reach the limit of their capabilities," says Ruben Navarro, 33, the Mexico City director of Vida Independiente. Navarro became paraplegic seven years ago, after breaking his back in a car accident. He says his first eight months after the injury were hell. "I didn't leave my house," he says. "I used to be athletic, active Ruben — and I thought it was all over." He slipped into the predominant feeling about disabilities in most of the world, epitomized in Mexico by the word pobrecito: poor thing. He couldn't do anything and relied on goodwill to get by. But Navarro began to reclaim his independence six years ago, when he showed up at this same course. Scattered around the courtyard of the city government's disability services office, called Indepedi, there are structures replicating street obstacles — stairs with a hand railing, metal platforms simulating curbs, potholes, metal grating. This class of more than 30 students of all ages is a nearly even split between men and women with all types of disabilities. The majority acquired disabilities after an accident. But many others, like Jasson, were born with a disability. Just a few minutes into class, nearly everyone is sweating. Navarro and the other coaches often sound like boot camp officers, barking orders, tolerating no complaints. When students say they're tired, the coaches tell them to try an obstacle again. "Our philosophy is to teach people how to fish, not give them a fish," he says. "Look around: Everyone here is working hard, they're all fighting to become independent and live a totally normal life." This boot camp attitude is most clear when someone falls over. As wheelchair user Alberto Paz tries to hop onto a simulated curb, he hits it wrong, loses his balance and tips sideways. Coaches sit around him, telling him how to position himself to get back up. He struggles as sweat drips down his face and veins in his forehead pulse. But he makes it. "This happens a lot here, it's part of the learning process," Paz says, panting every few words. "But better here than in the street, no?" More than half a million people in Mexico City have a disability, and getting around is certainly a challenge for them. But the city government has made huge advances in supporting people with disabilities, especially in the past five years or so since Fidel Perez de Leon, the current director of Indepedi — who is paraplegic — was appointed. You can see it: New sidewalk construction must include wheelchair ramps. Ninety-eight percent of the city's high-speed public buses are accessible. All public transportation is free if you have a disability. A new law will force all future construction in the city to be accessible. But Vida Independiente wants people in wheelchairs to be able to get around regardless of what the government does. Having mastered the streets, Jasson is now a coach at the workshop. Today he is sitting next to a 4-inch simulated curb. Nayeli Frias, 34, rolls up to it hesitantly and slams into the front, her torso jerking forward. "You're afraid of falling face-first, but you're strapped in," says Jasson. "What the worst that could happen?" "But I have fallen!" Frias pleads back. "I fell over in the street. I fell over at Walmart. I fell over in the elevator at the hospital." Frias has been coming to these courses for four months now. She hopes the training will allow her to start a new job, which would mean commuting across the city every day. "Here they push us until we lose our fear," she says. "Especially in my case, fear is what really holds me back." But she knows quitting isn't an option here. She turns around and prepares to hop the curb again. She aggressively rolls up to it and her rubber wheels screech as they land on the platform. Jasson gives her light praise and sends her over to try the higher curb. As Jasson leaves the workshop, the sidewalk ramp is blocked by a truck, so he goes around, through the street. Another truck blows by, just inches from his chair. He barely seems to notice, and continues on his way.